CogAT scoring is based on your child’s age (not grade level). Your child will receive what’s called an SAS, or “Standard Age Score,” which compares your child’s score against other children in the same age range. The highest SAS that a child can receive on the CogAT® is 160, while 100 is considered to be an average score. Raw Score. This is total number of questions answered correctly; however, incorrect answers do not cause points to be deducted from the overall raw score. Universal Scale Score (USS). After the Raw Score is determined, it’s converted to a normalized standard score known as the Universal Scale Score. 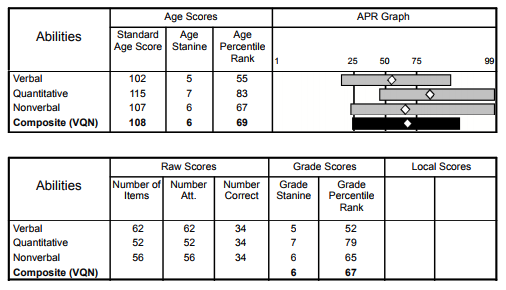 There are separate USS scores for each of the test’s three verbal, nonverbal and quantitative reasoning skills subsections (also called “batteries”). The Composite USS is determined by averaging these three different scores. Standard Age Score (SAS). The Standard Age Score has a maximum possible score of 160; the average score is 100. Percentile Rank (PR). School districts use this number to compare students that share the same age and grade level. A percentile rank of 80 means that child’s score was higher than 80% of students who took the same test. The average percentile rank is 50. Stanine (S). A stanine is a very broad, simplified score ranging from 1 (lowest) to 9 (highest possible), and it’s normalized for the child’s age and grade level. Each stanine is made up of a range of percentile ranks. The table below shows the percentile ranks that formulate each stanine and the associated ability level. You noted that the highest possible SAS score on the Cogat is 160. How can one explain a child scoring higher than 160? My kid has a score of 9E(v-) for the second grade. How is the explaination of the score? High or low? She is 8 years old. My daughter’s score is 7C(V+). May you please help me interpret. My child scored 8A. Please help me to interpret that. Thank you. Do you take into account personality and interests, likes/dislikes? Ability to communicate with adults and other children? Passions? Empathy? This is the most cookie cutter approach to understanding a child’s intellect that I’ve ever seen. Hi Julie – the CogAT test doesn’t assess the child’s EQ (emotional intelligence). It’s based solely on the cognitive ability of the child. what does it mean when your childs score is unavailable because their birthdate was out of testing range? My kid has a score 4A for the 5 grade, how is the score high or low she is 10 1/2 years old ? our child got 5E (N+) which is pretty much what we already knew. I have some questions about the age score. My daughter just took the test, and was 7 years 2 months old at the time. How will this impact her age score? I don’t quite understand how exactly they are coming up with a percentile rank. For example, if she had a 77 percentile grade score, how does that carry over into an age score? The school says they use whatever is higher between the grade score (2nd) and the age score. We get results in a couple of weeks. When you get the score, please send them to help@testingmom.com You are mentioning a score “77% percentile grade score” which we have not heard used for this test previously and we want to insure we provide accurate information. If you could forward or scan and forward the score, we can help interpret those results for you. My daughter had no score for the Verbal section and no Composite score, but it shows she attempted all 48 questions of the verbal section. What does that mean? Please reach out to the administrator of this test. This sounds like it could be an error in their scoring.